I love popcorn. It is my go to snack. Sometimes I don’t want just plain buttered popcorn, though I’d never turn that down. 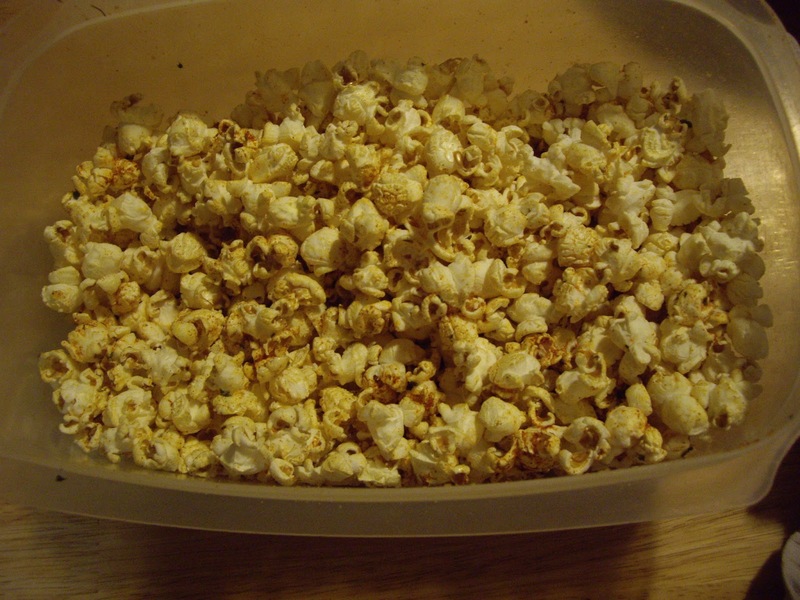 You will need a container with lid, large enough to hold the popcorn and be able to shake it around. In a small bowl, combine the paprika, cayenne pepper, parsley, garlic powder, and Parmesan cheese. Melt the butter and drizzle over the popcorn. Sprinkle lightly with the salt. Sprinkle the spice mixture over the popcorn. Cover with the lid and shake it really well to coat the popcorn. Take off lid and enjoy. Makes enough for 4 or more people. Sounds good. I've never added anything, except butter, to my popcorn. It'd be fun to try some different recipes. Yummy – this is just what I needed – I'm having a craving for something crunching and I'm trying to avoid the chip world – (the dark underbelly of my existence) so, I will give this a go! Jenny, I have a dear friend who grows her own popcorn and keep me supplied. I had to come up with yummy new ways to eat it.